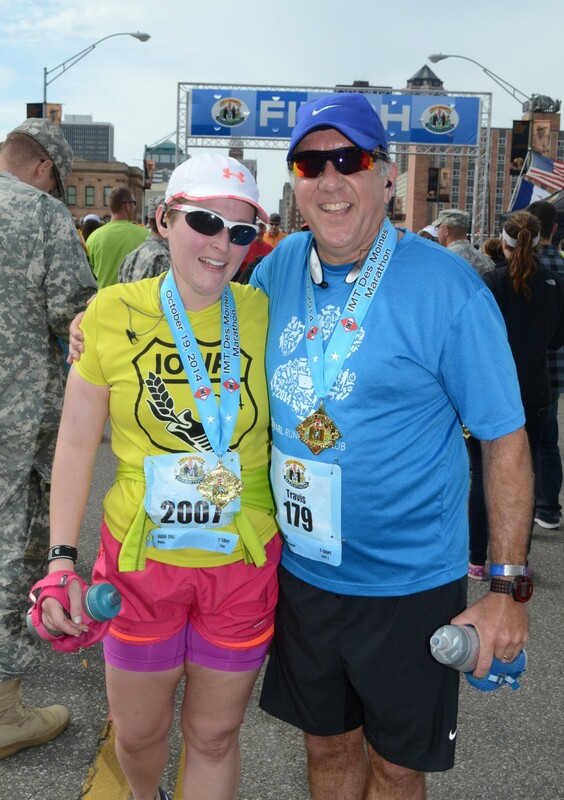 Applications are now being accepted for the 2015 iCan Marathon Training Group. Have you run at least a 10k race without walking, and dreamed of running a full 26.2 mile marathon? Well now is your chance. The iCan team will give you the tools you need to succeed in a athletic feat that only a small percentage of the population can claim they have achieved. You will get a training program for daily runs, including cross-training and rest days. You will get assistance from Coach Loran Storts and a group of mentors who have been exactly where you are now. You will join in on weekly group long runs up until the big day. But wait! There’s more! Did I mention the cost of all this training and mentoring? How much would you pay for a package like this?? The cost is an astoundingly affordable … free!!! Saturday morning was the date for the Leprechaun 10k, which for me has become an annual event. The 10k race allows the ladies (lasses) a 5:30 minute head start. Then, the men (lads) chase after the lasses. The first gender across the finish line wins not only a free beer for themselves, but also for their gender. People generally use this run as their first run of the season, and gets people who have hibernated long enough back out on the streets and into their running shoes. It was also my wife Julie’s first 10k race. She was a bit nervous about whether she could do it or not, but I assured her that she indeed could run that distance and I was sure she would! It was pretty chilly that morning, but the race didn’t start until 10am. It was hard to decide how much to wear, or whether to brave it and wear shorts and a t-shirt. Finally, we decided to bundle up and not freeze during the run. We met up with some of our running friends that meet at Fleet Feet Sports when we arrived, and we all tried to stay warm waiting for the start. Before long, the gun sounded, and the lasses were off! It didn’t seem like a long wait before the lads were off and running as well. It felt good to get moving, and before long I was catching up to the lasses. There was a lot of people in front of me, but I was doing pretty well. In one section of the race, we had to run down a side street and then back again. It really gives you a chance to not only see how many are in front of you, but you also get to look for people. I spotted Julie on that street, and she looked like she was doing well. So well in fact, I wasn’t sure if I would catch her. I finally caught her on mile three, just as we entered Gray’s Lake. julie was doing ok, but getting a little hot as it quickly started to warm up. We ran together until we reached the lake restrooms, where she turned off to shed a little clothing. I continued on, and finished in 54:33. While not my fastest time, it wasn’t bad and I got to run with Julie for a bit. Julie crossing the finish of her first 10k! She averaged a little over 11 minute miles, and was pretty consistant throughout the race. She is really doing amazingly well in such a short time. Sunday we met up with friends in Slater Iowa and rode our bikes to the High Trestle Trail. The wind was brutal that day, and we fought a head and cross wind all the way to the bridge. It was a fun time, and we got quite a workout, and this time there were no crashes. It felt like the wind was going to blow us off the road, but we stayed upright the whole time. Soon, all this area will be lush and green. It’s great that we can get out so early in the season, and are able to watch the spring season come alive! Hi everyone! It’s been a couple of weeks since my last post, and a lot of things have been going on. First on the agenda: triathlon training. The training takes up a lot of my time, as I am either in the pool or on my bike trainer. The swimming is by far the hardest part for me, and it still feels like I am not progressing as I should. My swim coach says it’ll be ok, but I get impatient with myself. My swim coach has completely changed my swim stroke in order to maximize efficiency while minimizing effort. It does feel better, but I haven’t gotten completely used to it and have to think about what I’m doing. I hope one day it will become second nature, and I can concentrate on what else I’m doing wrong. Our group meets on Wednesday nights, and after we get caught up on things, we hit the spin room. After an hour of spinning (for me, about 23 miles), we hit the track and run fartleks for a mile or so. Then we stretch, and head to the pool. We do a warm up for a total of 400 yards, then do drills as the coach watches us. We did a couple of new things in the last class; we treaded water while tossing a ball, and did a push war. The push war is where two people hold a long pole with floats and face each other. At the whistle, they hover and kick as hard as they can, attempting to push the other across the pool. I enjoyed the push war, but found out I stink at treading water. I also bought a bike trainer, along with some Sufferfest videos to use while riding. Sufferfest videos are advanced training videos that will really push you to your limits. I have yet to try the two hour video, as I am usually exhausted after one hour. It is my hope that as the weather gets warmer, my riding times will greatly improve. Saturday consisted of two runs: the Winter Warriors running group and the Sandwich Run. We met up for the group run at 8 am, and had a great 3 mile run through the East Village and around Principal Ballpark. Then, after a short wait, we participated in the Sandwich Run. It was a race where we ran 1.5 miles to the B&B Deli, picked up a “Killer” hoagie, and ran back to the Fleet Feet store, who sponsored the run. Then you had to eat the sandwich in order to finish the race. Prizes were awarded for the first man and women to finish the race and eat the sandwich, and for the person who predicts the closest to the time that it would take them to run and finish the sandwich. We took off, and I started off with a fast group. Before I knew it, there was three of us and no one else around. The guy in front was about a block ahead, and then it was a lady, Megan, who was keeping pace with him. I decided to try to pace with Megan and hope that I could hold that pace. We reached the store, grabbed a sandwich, posed for a photo, and hit the streets again. I was hoping the pace would slow, but that was not the case. It was the same all the way back. Megan and I crossed the line close to one another, and the gentleman leading was about 1 1/2 blocks ahead. We grabbed a plate, something to drink, and sat outside to eat our sandwiches. We cheered others as they finished and then joined us. Before long, the guy who led the race looked at me and said “I don’t think I can finish the other half of this sandwich”. Then he looked at my hands, and said “Where’s yours?” As I ate the last bite I smiled and said “I’m done”, and then went inside and checked in, winning the event. When everyone was finished, the times were checked, and I missed my total time by 1.5 minutes which was the closest time. So I ended up winning two gift certificates for more sandwiches. It was a great time, everyone had fun, and new friends were made. We are experiencing warm spring weather, so we decided to take the bikes out for a ride. The bike trails still have sections of ice on them, and that caused some issues as we both crashed on the ice. I think I got the worst of it, as I have a badly bruised hip. I am hoping that it is better tomorrow so I can go outside on a run. But the total ride was nice, it was great to be outside, and the first ride of the season was 42 miles. Now on to the surprise news. While waiting to start the sandwich run, the owner of Fleet Feet, Andy Roat, asked me if I had heard of Altra running shoes. I told him that I had, that I had heard good things about them, and that they seemed to be moving up quickly among the running community. Andy then mentioned that he knows I run in zero drop shoes, and would I consider trying on the Altra zero drops. If I liked them, Andy said that I could be the ambassador for Altra Shoes for Fleet Feet Des Moines. I told him that it would be an honor if the shoes felt good, as I would want to support something that I actually use. So, I tried on the two styles of zero drops that Andy had, and they both are great! One shoe feels like a true zero drop, as if you are running barefoot, and the other has better arch and side support, while still being a zero drop shoe. Andy said that I would be given a pair of shoes for free, so I could pick either one. It was a hard choice, but I picked the Provision (although I am considering buying the other pair as well). I never thought I would be offered something like this. I am not an elite runner, just a guy that loves to run, and loves to help others find the enjoyment in running and in fitness. Now I am actually representing a shoe company! It is an amazing feeling! Many people would say “it’s just a free pair of shoes”, but to me it is something else entirely . . . it is the culmination of the hard work that I put forth from the very start of this journey. I have went from only being able to run a quarter mile, to running a marathon. I have went from asking questions to mentors to becoming a mentor myself. It is a wonderful feeling, and now the running store I love going to is asking me to represent their product! It doesn’t get much better than that! These are the shoes I will be sporting soon.